Amtrak as we know it is in the budget crosshairs again, and if proposed cuts go through, it could have a lasting effect on not only our nation’s communities, but Railroad Retirement benefits as well. President Donald Trump’s budget request proposes a $1.06 billion reduction in funding to Amtrak. Service to rural and mid-sized city destinations would be drastically affected with the adoption of this plan, and 15 routes classified as long distance could eventually lose federal funding due to a change in how funds are allocated. Rather than cutting the routes outright, as has been proposed in previous Trump budgets, the 2020 plan would shift the money available to fund long-distance routes from Amtrak’s annual outlay to a competitive process. Over a four-year period, the administration would choose the routes that received funds with states applying for funding through the Restoration & Enhancement grant program. “The Trump Administration seems to be taking a page from anti-long-distance factions in Washington, looking to pit National Network services against the Northeast Corridor. And by moving it to a competitive grant program — controlled by the White House — the administration gets to choose the winners and losers,” Mathews said. The plan doesn’t sit well with the RPA’s Mathews, and it shouldn’t sit well with SMART Transportation Division rail members. Reducing Amtrak’s long-distance service will result in fewer people at work for the carrier. Fewer people working for the carrier means fewer railroaders paying into Railroad Retirement — a Railroad Retirement Board analysis of Trump’s 2018 budget proposal that would have cut Amtrak’s long-distance routes said an estimated 10,000 rail jobs would go away with the routes’ elimination. For long-distance rail service to continue, the 2020 budget document suggests that the 23 states that the routes run through begin footing the bill rather than the federal government, which handed many corporations a major tax reduction at the end of 2017. “In 2020, the Department of Transportation, Amtrak, states, and affected local Governments will collaborate to rationalize the Long Distance network to more efficiently serve modern market needs as a series of shorter-distance, high-performing corridor services where passenger rail as a transportation options (sic) makes sense,” the 2020 budget proposal states on page 78. The budget goes on to say that “low population areas along the routes will be better served by other modes of transportation, like intercity buses. “Over time, Federal support for Amtrak would be significantly reduced as Amtrak is able to right-size its network and States play a larger role, as they do now for State-supported and Northeast Corridor services,” the budget proposal concludes. But what happens to smaller places like Indiana, where routes are already in jeopardy? Mayor Dennis Buckley’s city of Beech Grove is home to one of three Amtrak repair facilities nationwide. The Indianapolis-area shop employs approximately 525 workers and is served by Amtrak’s Hoosier State line that transports passengers from Indianapolis to Chicago as well as Amtrak cars to the Beech Grove facility for repairs. 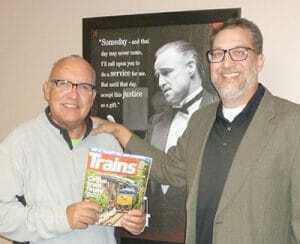 Beech Grove, Indiana, Mayor Dennis Buckley, left, holds a copy of Trains Magazine that featured his city’s Amtrak repair facility that was presented to him by SMART Transportation Division Indiana State Legislative Director Kenny Edwards, right. The state’s Legislature and the governor are looking to defund the route, Buckley said, and he finds himself having to fight for the jobs created by both Amtrak and by the businesses that have sprung up around the repair facility in his city of almost 15,000 people. In a letter to state legislators urging them to support the route, Buckley said that Amtrak brings $100 million to the economy of central Indiana and Beech Grove’s Marion County. “Amtrak must also become more competitive in the business of local mass transit,” Buckley said, but eliminating the four-stop, 196-mile route would be a severe blow to his community. As part of his effort, Buckley has reached out to Indianapolis media outlets. He would welcome it if SMART TD members who are Indiana residents talk to their legislators and state Gov. Eric Holcomb about maintaining the route’s funding. The targeting of Amtrak’s long-distance routes is not new. In addition to the administration’s yearly call to eliminate long-distance service, there was a battle waged last year over the Southwest Chief. Amtrak leadership had sought to replace portions of the route between Dodge City, Kan., to Albuquerque, N.M., with bus shuttles because of a lack of Positive Train Control (PTC) technology. Communities on the Chicago-to-Los Angeles daily route mobilized, and the activism of workers, passenger rail advocates, politicians and others preserved the route’s funding and operation as-is through 2019. Similar action might be needed yet again to prevent any proposed harmful cuts to Amtrak’s long-distance routes as the federal budgeting process continues. SMART Transportation Division will keep members apprised. To find out who represents you in Congress, visit the SMART TD Legislative Action Center.